I admit that my house is lived in. This may sound homey and comforting, but it also means that peanut butter cookie crumbs linger on my countertops longer than I'd like sometimes. Yes, I clean regularly, but I've always had a love-hate relationship with cleaning products. I have pets -- and, well, precious people live in my house, too. I live with a gnawing worry that all that guerilla warfare sanitizing stuff isn't so great for the folks and critters I'm trying to protect. The green movement comes in very handy here. I'm not talking about those hideously expensive "natural" cleansers that may or may not work. There's actually a very easy way to create an all-purpose cleaner that's effectively, safe and inexpensive. Stick with me for a second, and I'll explain. It's worth the wait. It turns out that a combination of hydrogen peroxide and vinegar is almost as effective as stronger cleansers like bleach when used in combination. 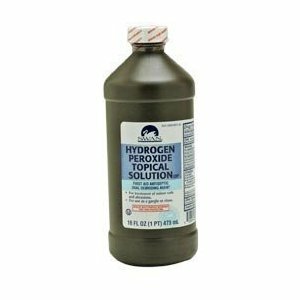 It gets better: When exposed to light or heat, hydrogen peroxide undergoes a chemical change and converts to pure water (that's why HP is sold in a dark bottle). That means it starts out as a powerful disinfectant, but after spraying it around, you end up with simple water. You don't have to rinse surfaces afterward or worry about chemical residue -- because there isn't any. When used in tandem with vinegar, the combination is totally safe and very effective at killing bacteria. Here's how it works: Hydrogen peroxide is actually a souped up water molecule that contains oxygen. When exposed to light (or heat), the oxygen, a strong antibacterial agent, is released. It produces germ killing bubbles and dissipates completely, leaving a simple (and safe) water residue behind. Vinegar itself is an effective acidic ingredient that has germ busting properties too. Spray vinegar (in my case, lavender vinegar) on a surface and follow up with a 3 percent hydrogen peroxide solution from a separate sprayer. (This is the concentration you'll probably come across in your market). Placing the two cleaners together in the same bottle won't work. The vinegar will destroy the peroxide. This is a two fisted approach. You will need to find (or make) a spray bottle that is completely opaque (light resistant) for the HP. 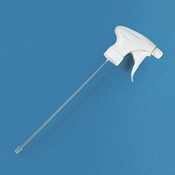 You may be able to find a screw on pump sprayer nozzle that will fit the peroxide bottle, though. To keep my kitchen clean and sweet smelling, I go one step further and infuse the vinegar with lavender. Lavender has antibacterial properties of its own and leaves behind a nice fragrance after the vinegar evaporates. 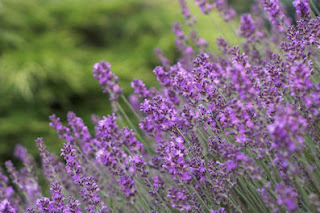 Lavender essential oil is inexpensive, and one small bottle goes a long way. For lavender scented vinegar, add 8 drops of lavender oil to every cup of distilled white vinegar. The preparation is ready to use right away. It will last for months in your cupboard. Combine 1/2 cup of dried lavender buds (or 1 cup of fresh buds) with 1-1/2 cups distilled white vinegar. Place the buds in a quart jar, bruise them slightly with a wooden spoon and then pour warmed vinegar (not boiling) over them. Cover the mouth of the jar with wax paper, add the lid and let the vinegar infuse for three to four weeks, shaking it occasionally. The completed infusion should have a vinegary smell with lavender undertones. The vinegar odor will dissipate but the lavender fragrance will linger. When the mixture is ready, strain it through cheese cloth or a coffee filter before putting it in a spray bottle. Special note: I use straight vinegar with hydrogen peroxide to clean produce from the garden or market sometimes, and to rinse egg shells. Although I don't use it to clean meats, poultry or fish, it can be used to clean and disinfect most types of food ingredients safely. No kidding. No rinsing necessary. Great tip, and Hydrogen peroxide is cheap! Anything to get away from bleach or ammonia. I love the aroma of lavender.